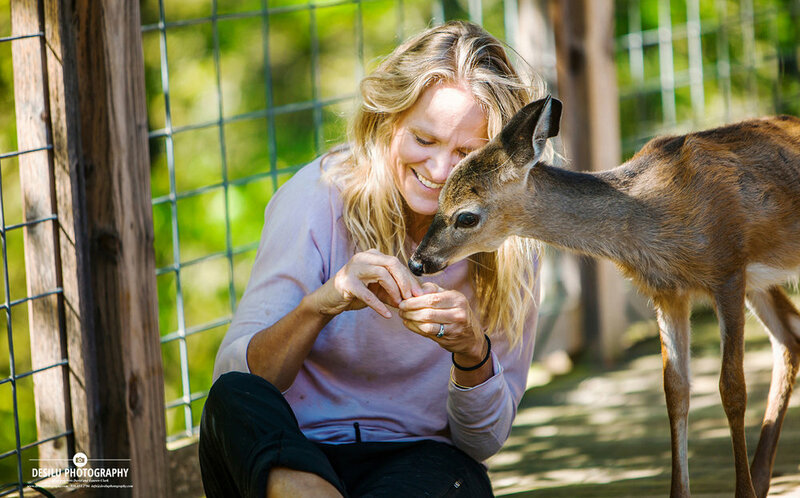 So when a four month old starving fawn walked up to me in the yard this past September, I felt those hooks sink in and I knew I was in for a life changing experience . I named her Farrah Fawncett. And Farrah was going to challenge how I could love something with a sense of detachment. I felt like new mom. Second guessing my every decision, googling what to feed, how much to feed this new baby. When her belly would swell from the fruit and goat milk I gave her.. I worried I might kill her.. but a quick google search tipped me off to adding baby gas drops to her milk. We live in the middle of a triangle of hunters, so every time I would hear a gunshot, I would hold my breath. But then she would pop her head out of the woods, reminding me that she felt safe here and was not going to wander off too far. People told me to put an orange collar on her, or an orange handkerchief, that she was now a family pet. I didn’t follow their advice. For one, she was not mine to keep or lay claim to, and secondly, I worried she’d get it hung up on something in the woods. Mostly, I didn’t want other deer to avoid her because of something “human” hanging around her neck. I wanted to keep her wild more than my need tokeep her mine. I’ve been connected to this landscape we live in since we moved ten years ago and through that landscape, I felt connected to Farrah. We are all part of nature, and nature is more about connections to the wild world than it is about taming it. I started to prepare myself for the morning she would not show up. And those occasional times she wouldn’t be waiting at the door, I would lose hours of my day just worrying about her, until she rambled up to the house mid-day. So it was a tightrope I balanced on. I learned to love without expectation. I learned to love something as much as I could and then let hope take over. When I wondered if she was lonely being out in the woods solo, I would look outside and watch her doing hot laps chasing the dogs around the fenced-in enclosure. She found a way to play with them on my terms. There are a handful of moments in my life that I feel are perfect, pure experiences. One evening I was walking the dogs down by the river. We had just had a big rain and this heavy fog had settled over the river but you could see the clouds turning a deep pink from the sunset. It was as if we were surrounded in a soft cotton candy colored fog. I turned to walk back up the trail and Farrah was standing behind us.As she joined us at the river , she was silhouetted in this amazing colored fog. I wished only for a second that I had a camera but then realized it would have taken me out of this moment and taken away the rawness of this experience. Farrah walked the trail with us, all of us still enveloped in this surreal fog. As long as I live, the memory of that evening will be etched into my mind. She began to take walks with us, then she started to follow me on my mountain bike though the trails. 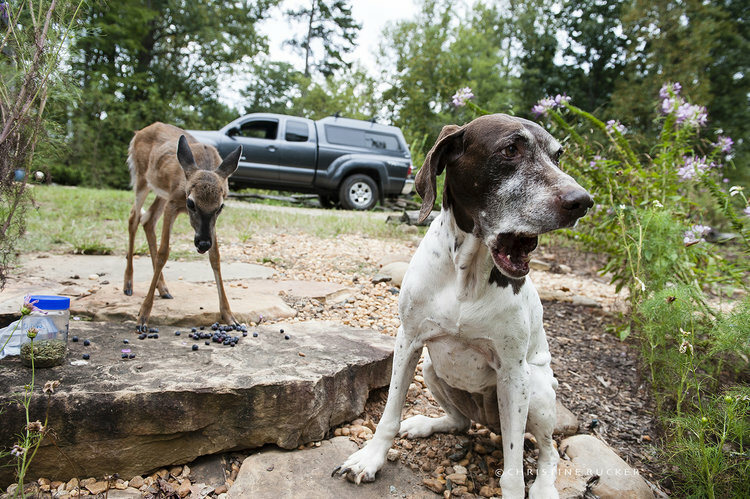 I finally let Bailey, my English pointer, off leash and she and Farrah would rip through the woods playing a hilarious game of tag and hide and seek. Farrah always won. She was returning where she belonged. But it hurt. And we missed her. When she would pop back out of the woods, I was almost as surprised as when I first saw her. A kind of excitement you might get when you see family member you haven’t seen in a while. A kind of fluttering inyour stomach. It’s been over two weeks since she last visited. Part of me is saying she’s moved on. Part of me is worried she ran into trouble. But all of my heart knows where ever she is, she had the loveof a human family, a free love that didn’t try to make her less wild. She was simply loved and given a little more advantage to survive. This story has been abbreviated for this blog. To read the full version published on May 10, 2017 with more photos and videos, visit Christine Rucker.